Exceptional graphic large format map commemorative of New York City by master engraver Charles Magnus. New-York City and County Map with Vicinity entire Brooklyn Williamsburgh Jersey City an c. in the 79th Year of Independence of the United States. 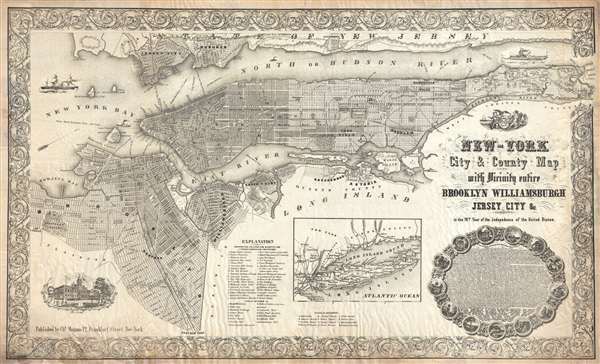 An altogether extraordinary 1855 broadside map of New York City issued by map publisher Charles Magnus in commemoration of the signing of the Declaration of Independence. Depicts the entirety of Manhattan as well as most of Brooklyn, Bedford-Stuyvsant, Williamsburg, Greenpoint, Queens, Ravenswood, Astoria, Jersey City and Hoboken. An inset map at the bottom center details Long Island. The whole is rendered in extraordinary detail with special attention given to individual streets, blocks, parks and even important buildings. Shows the beginnings of Hunters Point, or Long Island City in Queens. Important ferry crossings, canals, and railroads are also indicated. In Manhattan the map identifies various districts including Manhattanville, Yorkville, and Harlem. Central Park has yet to manifest and allthough the grid structure above 155th street is ghosted in, it has yet to be officially planned. Where Columbia University stands today this map shows the location of the New York Lunatic Asylum. In Hoboken, Jersey City, and Long Island City, several planned landfills are indicated. Also in Hoboken we see the Elysian Fields, a park expanse along the Hudson River that claims have hosted the world's first baseball game. At the bottom center of the map an alphanumerically keyed legend notes 'Universities, Colleges and Scientific and Literary, Benevolent-Institutions,' 'Public Buildings' and 'Places of Amusement.' In the lower left there is an inset engraved depiction of New York's City Hall. Steam ships are shown navigating the Hudson River in both the upper right and upper left quadrants. In the Lower right quadrant an elaborate medallion features the full text of the declaration of Independence as well as sigils representing each of the original 13 colonies. The whole is surrounding by a large an attractive acanthus leaf motif border. All in all, this is one of the finest and most visually appealing maps of New York City to appear in the 19th century. Good. Minor age toning, especially to edges. Slight loss repair to lower left border and to small spot on left border - apparently with the remains of another Magnus map. A few older edge rip repairs undone and expertly redone. Edges reinforced on verso all-around with pH neutral material. OCLC 23876813. Haskell, Daniel Carl, Manhattan Maps; a Co-operative List, 1004.